A recently built detached Chalet standing in gardens, of Medium/High Standard, ideally placed within the charming alpine village of Le Praz. 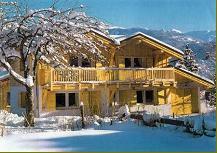 This Chalet is approx 200 metres level walk to the lifts and pistes. all rooms with en suite bathrooms with WC, Shower and Washbasins. A large comfortable lounge with open fire, together with a TV/Games area, south facing balcony with mountain views, and large entrance lobby with ski and boot storage, are features of this property. An Indoor hot tub is available for clients wishing to relax after a days skiing and the chalet has full Free WiFi. 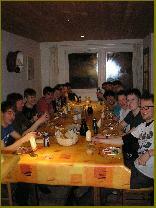 The Chalet can only be booked on a chalet board catered basis. One or two Families or a medium/large group of 10 to 14 persons. 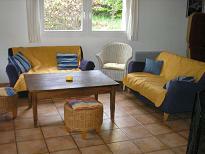 Rooms also sold individually for Couples or small groups. Large Entrance room with code lock and generous ski & boot storage. Spacious Lounge with Open Fire, TV, DVD, and Games area. Dining area with table to comfortably seat up to 18 guests. 2 x WC's with washbasins. 2 x Staircases to upper floor. Large Sunny South Facing Balcony with views of the mountains and ski jumps. The driveway of the Chalet has ample parking spaces for four cars. From 8:00am and consists of Tea, Coffee, Fruit Juice, Bread, Preserves, Cereals, Yogurts, Porridge, and Eggs to order. Fresh cake or biscuits left out daily for your return from skiing. The highlight of the day is served at 8:00pm, with three delicious courses topped off with fresh coffee, and throughout accompanied by unlimited local red and white wines. One evening per week the staff have their day off and there is no evening meal included on this night. Special Diets catered for BY PRIOR ARRANGEMENT ONLY. Thorough cleaning from previous week, and Fresh Bed Linen. Our resort staff will meet you on arrival to show you to the chalet and distribute keys and assist where necessary. Included: Bed Linen, Electric, Gas, Water, Towels and Tourist Taxes. Not Included: Travel (minibus airport transfers are available), Insurance. Courchevel le Praz - Catered Chalet Tramarins.